Catherine Woo is an artist based in Hobart, Tasmania. Over the past few years she has been exploring methods of collaborative image making with natural energies of rain, wind, evaporation and flow, to develop a language of pattern morphologies derived from ‘painting with weather’. 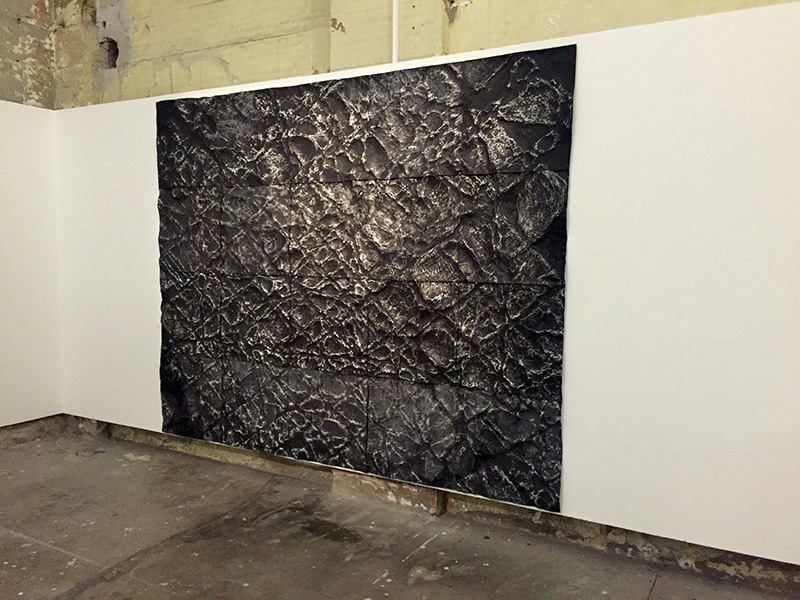 The resulting abstract, topographic, luminescent surfaces – with titles such as ‘Ebb’, ‘Ash’ and ‘Molten’ – are underpinned by consideration of our anthropogenic impacts on the environment. For Fieldwork, Catherine extended her explorations from ‘painting with weather’ to ’drawing with geology’. 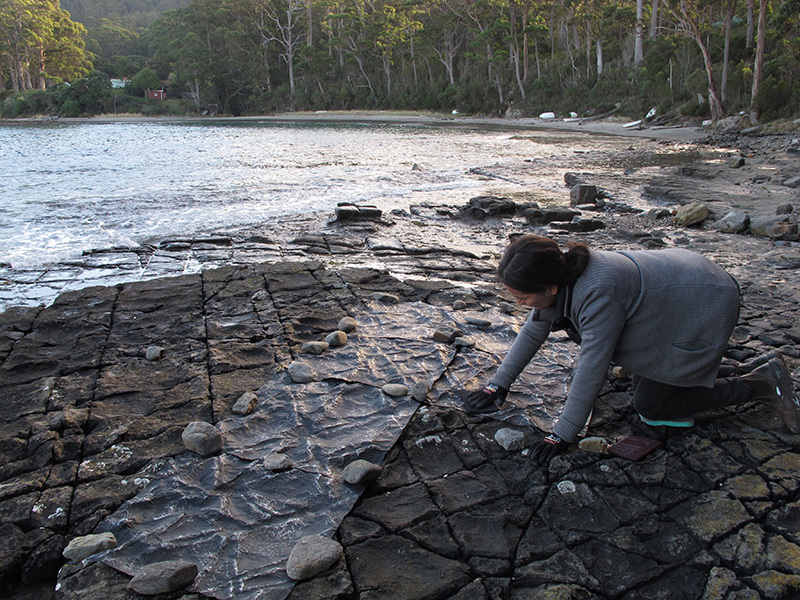 She spent long hours and days at a curious geological formation – the tessellated pavement along the shore of Pirates Bay, Tasmania – working on the ground to create a hand-wrought 3-dimensional impression of place by rubbing metallic paper onto and into the micro-topography of the weathered stone surface. The resulting work journals a space of negotiation between Artist and Earth, depicting ‘traces of alliance’ between her contemporary human agency and deep geologic time. Her deliberate purposeful rubbing distresses the metallic sheets she has positioned between her soft body and the resilient ancient stone. The medium dutifully records her actions, becoming an evidentiary artefact of engagement, a compelling register of touch-action interface. On the gallery wall, lifted away from it’s primordial locus of tidal rhythm, inundation and evaporation, of water, wind and sound energies, the hard-worked surface exerts a new presence – silent, ominous, scarified, emanating a sense of dark distress, of chthonic potential.